Various Artists - General Zhao Zi Long, On Horseback, Saves His Master All By Himself. Vinyl LP. Bleep. 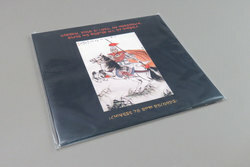 Super cool compilation of early Chinese opera songs, folkloric stylings and more from some of the golden era artists of China’s 78rpm record industry. Mei Lan Fang, Bai Ju Rong, Fukien Opera etc grace this first outing from Fire Sheep, kicking the label off in a fine ethnographic style. Just be warned, if pristine sound quality is what you’re after then these scratchy old transfers might not be the ticket. However, if you’d like to own a pretty definitive collection of these impossibly rare recordings then don’t hesitate. 250 Copies only.